Lately, Paul Simon's words have begun to seem all too relevant. America is reeling economically, environmentally, and spiritually. Amidst massive oil spills, an ongoing war, widespread poverty and unemployment, and political polarization, mainstream news outlets continue to assault us with Kardashians, "Housewives," and the "Jersey Shore." Back in the mid 1970's, America faced a similar state, as it dealt with the aftermath of Vietnam, a failing economy, the turmoil of Watergate, and a massive gasoline shortage. At least for a while, in the spring of 1974, baseball gave us a noble hero, whose honorable quest to break Babe Ruth's home run record gave us something to feel good about and distract us from our woes. This hero was Hank Aaron -- a quiet, humble, persistently skilled man who personified traditional American values and work ethic. 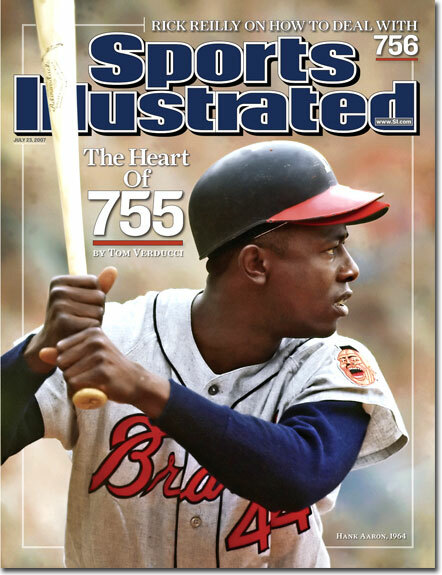 "There is something warming and elegant about Hank Aaron's long conservation of his powers, but lifetime records lack urgency. This was not a sudden prodigy, like batting over .400 or hitting sixty home runs in a single season. 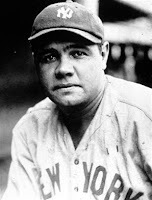 Babe Ruth was prodigious; Bad Henry is -- well, historic. " This excerpt from Roger Angell's "Landscape, With Figures,"* was written in 1974, shortly after Hammerin' Hank had etched his name into history as the greatest, and perhaps baseball's final, true home run king. Angell, in his usual elegant prose, hones in directly on the essence of the accomplishment - a lifetime of consistently outstanding performance. Note Angell's wording: "conservation of powers;" here, he isn't referring to power in the ESPN-era, in your face, highlights-only sense. By "powers", Angell likely alludes to health, consistency, and, ultimately, self-discipline. Just look at a photo of Hank Aaron, and you'll see what appears to be a mere mortal - an ordinary man who has transformed himself into a hero through perseverance and dedication. It was not hulk-like biceps or self-aggrandizing pride that gave Aaron the power to lift American spirits; it was, conversely, his humanity that allowed the common citizen to identify with his struggle, and to find redemption in his success. And that is exactly why, in the midst of our current national slump, it is impossible to find inspiration in baseball's latest "heroic" offering: Alex Rodriguez. Sure, A-Rod has hit 600 baseballs that exited various major league stadiums, and has occasionally delivered a timely hit in a big spot. But, at nearly every key juncture of his career, he has managed to distance himself from the ideals of the common man and the ethical standards that we expect of our heroes and role models. Whether slapping the ball out of Bronson Arroyo's hand in the 2004 ALCS, distracting an opposing fielder by shouting like a sore-headed little-leaguer, or preening across Dallas Braden's pitching mound, Rodriguez has demonstrated little awareness or concern for the spirit and tradition of the game, and has shown himself to be a braggart, a cheat, and a coward. And this is before performance-enhancing substances even enter the conversation. Of course, when you consider the impact of steroids upon the historical structure of the game, the recent A-Rod milestone reveals itself as not only a false accomplishment, but as a destructive threat to one of the great pleasures of baseball fandom. 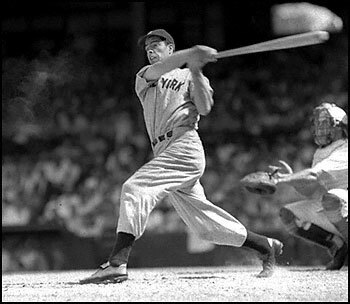 Roger Angell wrote that "the statistics of baseball form the critical dimensions of the game", and that "the ballplayers on the field are in competition not just with the pitchers and sluggers of the opposing team but with every pitcher or batter who ever played the game, including their past selves." Comparing and weighing the merits of one's favorite players against those of other eras and generations is a time-honored pastime which has filled countless hours in the off-season, and served as fodder for millions of barroom debates. Such discussion, though, relies upon the strong foundation of baseball's rules, and the reasonable assumption that, because the game is still played today the way it was in 1927, a player's performance and ability can be gauged in terms of the numbers. Once you introduce steroids into the argument, however, the sacred numbers no longer offer a firm basis for comparison, and a necessary ingredient for true appreciation of the game as a tradition is destroyed. For this, we can thank A-Rod, Mark McGwire, almost certainly Barry Bonds, and ESPN, which has helped to create the culture in which the me-first mentality trumps concern for ethics. It's not too difficult to understand why Paul Simon appealed to Joe DiMaggio for salvation, and he certainly wasn't the first to do so. In Ernest Hemingway's "Old Man and the Sea," Santiago feels a kinship with DiMaggio, partly because of his background: "They say his father was a fisherman. Maybe he was as poor as we are, and would understand." The old man also continually affirms the greatness of Joltin' Joe, placing faith in his hero and ultimately using his example of "playing through pain" to see him through his own ordeal at sea. A-Rod may have also transcended humble beginnings to find fame and fortune in the big leagues, but the similarities end there. While DiMaggio was known for dependability and cool under pressure, Rodriguez has, for the most part, left Yankee fans angry and frustrated at his failure in clutch playoff situations. And that's why I find Yankee fans' reaction to the 600 homer hoopla so puzzling. Last week, when #600 occurred, several of my Yankee-loving colleagues joyfully whooped it up. The way I see it, though, a Yankee fan should be the last person to actually get behind Rodriguez, especially as he approaches the hallowed domain of a true Yankee legend, Babe Ruth. If it's not already apparent, I'm not a Yankee fan. I am, however, a true enough fan of baseball to acknowledge the significance of the Yankees as a baseball institution. In many ways, the Yankees are baseball, and outside of the U.S., the Yankees are America.The pinstripes, the logo, the stadium, the monuments, the iconic players - all embody baseball's proudest and most accomplished franchise. While I've often argued that being a Yankee fan is too easy, and that rooting for a team like the Mets or Red Sox is a better exercise in character-building, the Yankees and their fans do shoulder a different burden: the weight of historical reputation. Yankee fans are privileged to bear the pinstripes, and to see the best assemblage of players that money can buy, year after year. But they are also the guardians of baseball's greatest legacies - Ruth, Gehrig, DiMaggio, Mantle, Munson, Guidry, Rivera, Jeter. Alex Rodriguez has no business being listed with these immortals, and true Yankee fans should recognize that doing so soils the fabric of Yankee tradition. A casual baseball observer might be excused for getting excited about the number "600," but a Yankee fan should know better. If you love baseball, and all that it means and has meant as an American tradition, you should reject A-Rod and all he represents. Call me an idealist. Call me naive. Tell me that the game has changed, and that it's all about the numbers. I'll just keep listening to Paul Simon and hoping that a true hero will emerge to give baseball, and America, what it needs the most right now. * Excerpted from "Five Seasons: A Baseball Companion" by Roger Angell. Simon and Schuster, New York, 1977. A must-read for fans of baseball and writing. im a student and i am personally offended of what you think of us 'yankee fans' you cant generalize like that. 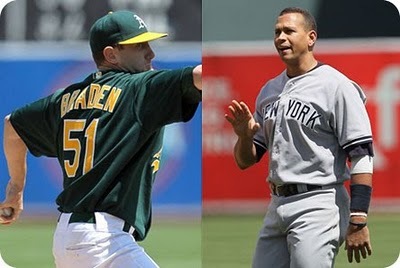 to say that arod doesnt deserve what he has is crazy, he took steroids when he was not on the yankees. his personality and morals shouldnt affect his baseball skills. Thanks for the comment. While I'm not a Yankee fan, if you read the post carefully, I'm not saying anything negative about Yankee fans. 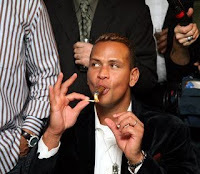 In fact, I'm saying that Yankee fans deserve better than A-Rod, given their rich history. I am saying that Yankee fans have the responsibility to hold their players to a higher standard, but I don't think that's a knock on the fans themselves. Alex Rodriguez' morals and personality may not affect his baseball skills, but my argument is more that a baseball hero should be heroic on and off the field. I guess I'm "old school," but I feel that athletes should serves as positive, inspirational examples for the common person. I also don't think it's "crazy" to question the validity of A-Rod's accomplishments. To be fair, I'd also say that the same is true of many modern players in the "steroid era." It's pretty clear that many players have used illegal substances to give them unfair advantages. The reason I chose to write about A-Rod, specifically, though, was because of how some people reacted to his recent achievement. I realize my argument is rather one-sided, but that's what persuasive writing is all about! I have many friends who are Yankee fans, and some of them agree with me. I may not convince everyone, but it's fun to try.